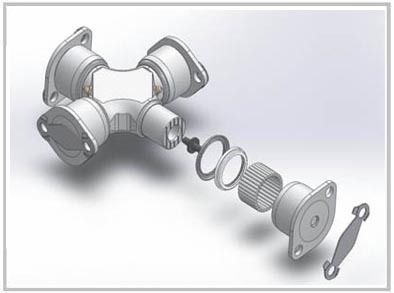 The dimensions of universal joint, brake drum and brake rotor were calculated using 3D scanning, CMM technique as well as manual measurement methods. For reverse engineering requirements, the parts were disassembled and individual component dimensions were measured. Based on the details captured, a CAD model was developed to digitally document the design information. Further design changes were performed as per client’s requirements and final assembly with detailed manufacturing drawings was prepared. One of the prominent aftermarket auto parts manufacturers from USA needed reverse engineering solution for a broad inventory of their products. Hi-Tech offered a qualitative solution for three major automotive parts using a team of qualified CAD professional and design engineers. Based on the receipt of parts from the client, a digital design process was initiated. Dimensions were calculated manually as well as using 3D scanning and CMM methods. For reverse engineering universal joint, brake drum and disc brake rotor, entire assembly was disassembled and individual component dimensions were recorded with detailed information on material, fits and tolerances. The information obtained was utilized to develop CAD drawings for inspection purposes and identification of design improvements in critical regions leading to early failures. Based on the inputs received from the client, the designs of the parts were altered and final assembly drawings were developed. 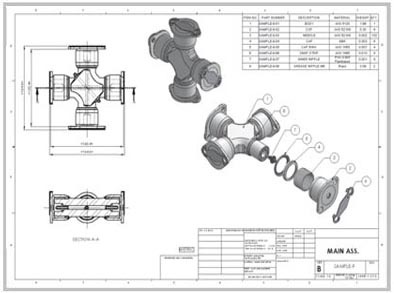 Additionally, detailed manufacturing drawings were also developed to meet the shop floor requirements.